Objective: To explore the effect of Ape1/Ref-1 on injury caused by stereotactic ablative radiotherapy in the treatment of early stage non-small cell lung cancer. Method: Human lung cancer cell line A549 cells or irradiated A549 cells, which received 8 MV X ray radiation exposure were treated with different concentrations of genistein (30, 60, and 90 μM) for 1, 2, or 3 d. Western blot was used to measure the expression levels of Ape1/Ref-1 and p53. Luciferase reporter gene assay was used to measure the relationship between p53 and Ape1/Ref-1. Results: Genistein suppressed the expression of Ape1/Ref-1 in A549 cells in a time- and dose-dependent manner. In contrast, genistein increased the expression of p53 in A549 cells in a time- and dosedependent manner. Irradiation of cells further suppressed the expression of Ape1/Ref-1 in A549 cells and increased the expression of p53 in A549 cells. Stereotactic Ablative Radiotherapy (SABR) in combination with genistein not only reduced the expression levels of Ape1/Ref-1, but also increased the expression of p53. Moreover, p53 reduced the transcriptional activity of Ape1/Ref-1 promoter. Conclusion: SABR in combination with genistein increased the expression of p53 in A549 cells, leading to down regulation of Ape1/Ref-1. This study indicated that SABR in combination with genistein might be of great significance in the treatment of early stage Non-Small Cell Lung Cancer (NSCLC). Cancer seriously threatens human life and health. The incidence of lung cancer is increasing. Lung cancer has become the leading cause of cancer-related death in China with increased incidence [1-3]. It is estimated that in 2015, the total number of new cases of lung cancer will reach 733 300 . Lung cancer is characterized by slower cell growth and division, slower metastasis, and a high degree of differentiation . Surgical excision is often used in the treatment of earlystage of lung cancer in clinic . For recurrent patients who cannot take surgeries (such as having diseases of circulatory system, endocrine system, or blood system, especially in elder patients), or patients who refused surgeries, radiation therapy combined with drugs treatment is commonly and widely applied. Stereotactic Ablative Radiotherapy (SABR) is widely used in the treatment of early stage non-small cell lung cancer . Genistein is a sensitizer of cancer radiotherapy which strengthens the sensitivity of tumor cells to SABR, leading to inhibition of cell growth and induction of apoptosis. SABR combined with genistein has showed promising results on patients with NSCLC, but it also can cause radiation injury. It has been shown that Reactive Oxygen Species (ROS) (ionizing radiation) affects normal gene expressions through damaging the synthesis of DNA, protein, and lipid, resulting in subsequent tumor progression . Therefore, prevention and treatment of radiation-induced lung injury can be performed in two aspects. Investigations on the development and utilization of compounds to lower ROS have become a hotspot research area. However, studies on the prevention and treatment of radiation-induced lung injury through regulation of gene expressions are rare but have impressive prospects [8,9]. Studies have shown that, Ape1/Ref-1 protein (apurinic/ apyrimidinic endonuclease 1/redox factor-1) is involved in DNA repair, RNA metabolism, and cell cycle regulation . In addition, it also regulates the transcription activity of certain tumor suppressor genes, such as AP-1, NF-KB, and p53, leading to regulation of the expression of downstream genes [10,11]. In recent years, researchers found that genistein can not only enhance the radiosensitivity of tumor cells, but also regulate the expression and interaction of Ape1/Ref-1 and p53. In the present study, we aimed to investigate the effect of SABR in combination with genistein on the treatment of NSCLC through treating A549 cells or irradiated A549 cells with different concentrations of genistein. A549 cells were provided by Zhengzhou University Cancer Institute (Henan, China). EMSA kit was purchased from Thermo Fisher scientific (Waltham, MA, USA). Inverted microscope CKX-41 was purchased from Olympus (Shinjuku, Tokyo, Japan). Gel imaging system, automatic microplate reader, and ultra-low temperature refrigerator were purchased from Bio-Rad (Hercules, California, USA). Confocal microscope was purchased from Leica (Wetzlar, Germany). Anti-Ape1/Ref-1 monoclonal antibody, anti-β-actin monoclonal antibody, and fetal bovine serum were purchased from Invitrogen (Waltham, MA, USA). MTT solution, trypan blue dye, protein lysis buffer were purchased from Beijing Zhongshan Golden Bridge (Beijing, China). DMEM culture medium and trypsin were purchased from Hyclone (San Angelo, Texas, USA). DMSO, PMSF, and genistein were purchased from Sigma-Aldrich (St. Louis, MO, USA). 4% paraformaldehyde, PBS solution, and penicillin/streptomycin were purchased from Jiangsu Biyuntian biotech (Nantong, China). A549 lung cancer cells were conventionally cultured in DMEM medium with 10% FBS at 37°C incubator with 5% carbon dioxide. Irradiated A549 cells received 8 MV X ray radiation exposure and then were cultured for another 24, 48, or 72 h. The genistein powder was dissolved in DMSO to a final concentration of 100 mmol/L. After reaching 75% confluence, cultured A549 cells or irradiated A549 cells were treated with final concentrations of genistein (30, 60 or 90 μM). DMSO with different concentration was used as controls. (1) A549 cells in logarithmic phase were inoculated, cultured, and divided into Control group (Control), Genistein group (Gen), Irradiation group (Rad), the Genistein+Radiation group (G+R). The control group (Control) was give 30 μmol/L DMSO, the drug group (Gen) was give 30 μmol/L genistein, Irradiation group (Rad) was received radiation (24 h 10 MV) X ray, genistein+irradiation group (G+R) was administered 30 μmol/L of genistein and X ray radiation (24 h 10 MV). (2) 72 h after incubation, cells were tripsinized, trypan blue stained, observed under an inverted microscope, and counted. Cells were then collected, lysed for western blot analysis of expression levels of Ape1/Ref-1 and p53. (1) p53 and luciferase reporter gene vector were transfected into A549 cells. Western blot assay was used to measure the expression levels of Ape1/Ref-1. Dual-luciferase reporter gene assay was used to monitor the regulation of transcriptional activity of regulating its promoter region by p53. (2) Co-transfection of 0.5 μg of luciferase reporter gene vector and different amounts wild-type p53 plasmid. Western blot assay was used to measure the expression level changes of Ape1/Ref-1 along with the changes of p53. (3) Co-transfection of 0.5 μg of luciferase reporter gene vector and different amounts wild-type p53 plasmid. Cells were collected and dual-luciferase reporter gene assay was used to monitor the regulation of transcriptional activity of regulating its promoter region by p53. SPSS 13.0 was used for statistical analysis. All data are expressed as mean ± Standard Error (SE). Differences between groups were analysed by t-test. P<0.05 was considered statistically significant. Under the same treatment time (3 d), Ape1/Ref-1 expression was decreased and p53 expression was increased with elevated genistein concentration. Under the same genistein concentration (60μ M), Ape1/Ref-1 expression decreased along with the increase of treatment time, while p53 expression increased along with the increase of treatment time (Figure 1). No difference of the expression levels of Ape1/Ref-1 or p53 was found in control group. These data suggested that the expression of Ape1/Ref-1 was negatively associated with genistein concentration and treatment time, and the expression of p53 was positively associated with genistein concentration and treatment time (Figure 1). Figure 1: Effect of genistein on the expression of p53 and Ape1/Ref-1 in A549 cells. (A) Effect of genistein on the expression of Ape1/Ref-1, (B) Effect of genistein on the expression of p53. Genistein treatment decreased the expression levels of Ape1/ Ref-1 (4836 ± 85.6 vs. 6437 ± 121.2 for control) (P<0.05) but increased the expression levels of p53 (3024 ± 71.6 vs. 1995 ± 50.3 for control) (P<0.05). Radiation increased the expression levels of both Ape1/Ref-1 (11850 ± 231.2) and p53 (3179 ± 56.9) compared with control (P<0.05). Genistein plus radiation slightly increased the expression levels of Ape1/Ref-1 (7016 ± 162.1) but significantly increased the expression levels of p53 (4625 ± 86.5) compared with radiation alone treatment (P<0.05). These data suggested that genistein alone decreased the expression levels of Ape1/Ref-1 but increased the expression levels of p53. Genistein plus radiation attenuated radiation-induced up-regulation of Ape1/Ref-1 and enhanced radiation-induced up-regulation of p53 (Figure 2). 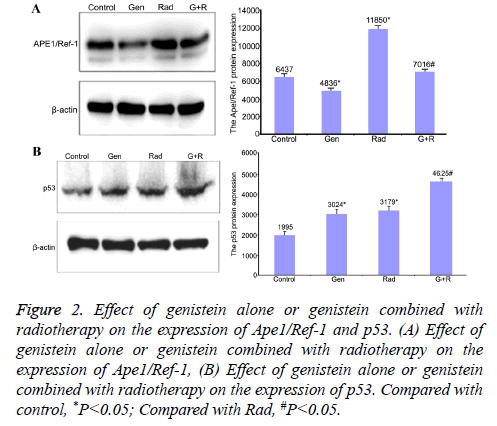 Figure 2: Effect of genistein alone or genistein combined with radiotherapy on the expression of Ape1/Ref-1 and p53. (A) Effect of genistein alone or genistein combined with radiotherapy on the expression of Ape1/Ref-1, (B) Effect of genistein alone or genistein combined with radiotherapy on the expression of p53. Compared with control, *P<0.05; Compared with Rad, #P<0.05. Western blot results showed that the expression levels of Ape1/ Ref-1 decreased along with the increased quantity of transfected WTp53 plasmid (Figure 3). Figure 3: Effect of p53 on the transcription activity of APE1 promoter and the expression of Ape1/Ref-1. 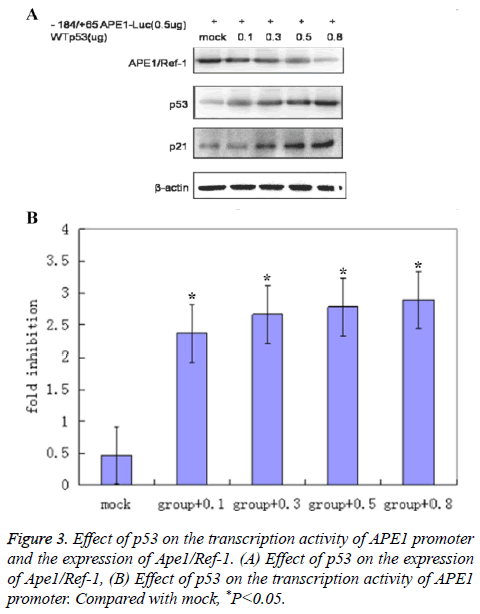 (A) Effect of p53 on the expression of Ape1/Ref-1, (B) Effect of p53 on the transcription activity of APE1 promoter. Compared with mock, *P<0.05. Dual luciferase assay results showed that p53’s inhibitory effect on the transcription activity of APE1 promoter region increased with the increase of quantity of transfected WTp53 plasmid (Figure 3) (2.35 ± 0.63 for group+0.1; 2.68 ± 0.72 for group+0.3; 2.82 ± 0.75 for group+0.5; 2.91 ± 0.81 for group +0.8; 0.5 ± 0.09 for mock) (P<0.05 compared with mock), suggesting that p53 might inhibit the expression of Ape1/Ref-1 through suppression of the transcription activity of APE1 promoter region. Tumors are heterogeneous and therapeutic therapy targeting either cell growth signaling pathways or proteins is currently the most promising approach for tumor therapy [12,13]. Research has shown that up-regulation of Ape1/Ref-1 is related to tumor resistance to chemotherapy. In order to maintain or increase tumor cell sensitivity to radiotherapy and chemotherapy, the expression of Ape1/Ref-1 must be inhibited to improve the efficacy and prognosis . In addition, a number of scientific studies have confirmed that inhibition of Ape1/Ref-1 by antisense oligonucleotide technology promoted apoptosis of tumor cells and increased the sensitivity to chemotherapy and radiotherapy . Moreover, levels of Ape1/Ref-1 were negatively correlated with chemotherapy, radiotherapy, prognosis, and the survival rate. Therefore, targeting Ape1/Ref-1 to increase tumor cell sensitivity to chemotherapy is of great significance [16-19]. This study showed that the expression levels of Ape1/Ref-1 were negatively associated with the dose and time of genistein treatment, whereas the expression levels of p53 were positively associated with the dose and time of genistein treatment. Genistein alone could suppress the expression of Ape1/Ref-1 and enhance the expression of p53. However, genistein combined with irradiation attenuated radiation-induced upregulation of Ape1/Ref-1 and enhanced radiation-induced upregulation of p53. p53 might inhibit the expression of Ape1/ Ref-1 through suppression the transcription activity of APE1 promoter region. Taken together, genistein combined with irradiation can not only directly reduce the expression of Ape1 /Ref-1, but also indirectly reduce the expression of Ape1/ Ref-1 through suppression of the transcription activity of Ape1/Ref-1 promoter, leading to improved treatment efficiency of NSCLC. Ape1/Ref-1 protein is a polymer consisting of 318 amino acids in different spatial structures with a molecular weight of 37 kDa. It is mainly composed by the α/β globular protein including the N-terminal and C-terminal core areas. Nterminal and C-terminal jointly maintain the normal expression of Ape1/Ref-1 protein with N-terminal regulating the metabolism of transcription factors and the C-terminal responsible for DNA damage and repair . p53 protein is composed of 393 amino acids which form 4 different spatial zones with p53C zone being closely related to the inhibition of tumor cells . It has been shown that Ape1/Ref-1 is closely associated with the p53 protein to enhance the activity of p53C . In conclusion, genistein combined with radiation downregulated the expression level of Ape1/Ref-1 and up-regulated p53 expression, promoted base excision repair of DNA damage through direct action on C terminal core region of Ape1/Ref-1. Combined treatment also promoted the binding of p53 with DNA to inhibit the growth of tumor cells. Regarding the radiation injury of SABR in the treatment of early stage NSCLC, Ape1/Ref-1 not only corrected altered gene expression but also decreased the resistance to chemotherapy and radiation. Therefore, Ape1/Ref-1 might be a potential novel target in the treatment of radiation injury in early state NSCLC. Ray PD, Huang BW, Tsuji Y. Reactive Oxygen Species (ROS) homeostasis and redox regulation in cellular signaling. Cell Signal 2012; 24: 981-990. Azzam EI, Jay-Gerin JP, Pain D. Ionizing radiation-induced metabolic oxidative stress and prolonged cell injury. Cancer Lett 2012; 327: 48-60. De Nicola GM, Karreth FA, Humpton TJ. Oncogene-induced Nrf2 transcription promotes ROS detoxification and tumorigenesis. Nature 2011; 475: 106-109. Lee B, Liu W. The treatment low divided radiotherapy combined clinical observation on treatment of senile non-small cell lung cancer. J West Med 2013; 25: 1312-1315. Spira A, Ettinger DS. Multidisciplinary management of lung cancer. N Engl J Med 2012; 350: 379-392. Sun B. ASTRO stereotactic radiotherapy: beyond medical inoperable stage I NSCLC. J Clin Pathol 2015; 35: 2061-2062. Rubin P, Finkelstein J, Shapiro D. Molecular biology mechanisms in the radiation induction of pulmonary injury syndromes: interrelationship between the alveolar macrophage and the septal fibroblast. Int J Radiat Oncol Biol Phys 2012; 24: 93. Epperly MW, Guo HI, Jefferson M, Nie S, Gretton J, Bernarding M, Bar-Sagi D, Archer H, Greenberger JS. Cell phenotype specific kinetics of expression of intratracheally injected manganese superoxide dismutase plasmid/liposomes (MnSOYPI) during radioprotective gene therapy. Gene Ther 2013; 10: 163. Rabbani ZN, Anscher MS, Zhang X, Chen L, Samulski TV, Li CY, Vujaskovic Z. Soluble TGF-beta type? receptor gene therapy ameliorates acute radiation-induced pulmonary injury in rats. Int J Radiat Oncol Biol Phys 2013; 57: 563. Evans AR, Limp-Foster M, Kelley MR. Going APE over ref-1. Mutat Res 2000; 461: 83-108. Tell G, Damante G, Caldwell D, Kelley MR. The Intracellular localization of APE1/Ref-1: more than a passive phenomenon? Antioxid Redox Signal 2005; 7: 367-384. Yan W, Chen X. Characterization of functional domains necessary for mutant p53 gain of function. J Biol Chem 2010; 285: 14229-14238. Post SM, Quintas-Cardama A, Pant V, Iwakuma T, Hamir A, Jackson JG, Maccio DR, Bond GL, Johnson DG, Levine AJ, Lozano G. A high frequency regulatory polymorphism in the p53 pathway accelerates tumor development. Cancer Cell 2010; 18: 220-230. Hanson S, Kim E, Deppert W. Redox factor 1 (Ref-1) enhances specific DNA binding of p53 by promoting p53 tetramerization. Oncogene 2013; 24: 1641-1647. Li QS, Li CY, Li ZL, Zhu HL. Genistein and its synthetic analogs as anticancer agents. Anticancer Agents Med Chem 2012; 12: 271-281. Raffoul JJ, Heydari AR, Hillman GG. DNA repair and cancer therapy: targeting APE1/Ref-1 using dietary agents. J Oncol 2012; 370481. Kelley MR, Fishel FL. DNA repair proteins as molecular targets for cancer therapeutics. Anticancer Agents Med Chem 2013; 8: 417-425. Fishel ML, Kelley MR. The DNA base excision repair protein Ape1/Ref-1 as a therapeutic and chemopreventive target. Mol Aspects Med 2012; 28: 375-395. Bapat A, Fishel ML, Kelley MR. Going ape as an approach to cancer therapeutics. Antioxid Redox Signal 2012; 11: 651-668. Tell G, Quadrifoglio F, Tiribelli C, Kelley MR. The many functions of APE1: not only a DNA repair enzyme. Antioxid Redox Signal 2009; 11: 601-620. Joerger AC, Fersht AR. Structural biology of the tumor suppressor p53. Ann Rev Biochem 2011; 77: 557-582. Furgason JM, Bahassi M. Targeting DNA repair mechanisms in cancer. Pharmacol Ther 2013; 137: 298-308.